Updated and added a few parks. Sturegeon Bay skatepark is currently under construction of a great all cement park from Dreamland Skateparks and will be done by the end of August. Appleton Skatepark has all their funds and it looks like construction should start in a week or two and is being done by California Skateparks. Well I haven't been updating this news pages, but I have been continually adding new parks to the site including a few that were just built this summer. Check out The New Eau Claire Skatepark that was just built. It's a small park but it's a full concrete build by Evergreen skateparks and is continuing the great trend of cement parks in Wisconsin that we will be able to keep using. 4/9/2013 - Check out our Facebook! We just released our facebook page to the public now that our listing is getting a little closer to finish. Give our page a "like" HERE! 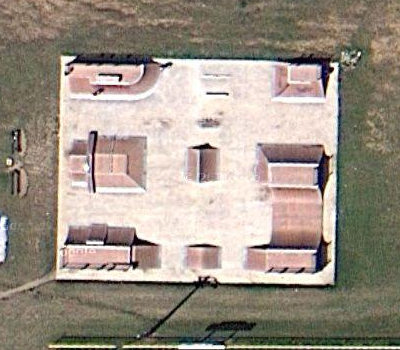 (Wisconsin Skateparks). Facebook can be used as a great place for you to interact with us to provide more information and recommend videos that you would rather see on the skatepark pages. Let us know if there are any new skatepark initiatives coming up as I will be posting more of those also. Can't wait to be able to provide an accurate address for every park in wisconsin. No More Deep Searching Just To Find A Skatepark!!! Added more parks to the list. Cedarburg, Delavan, East Troy, Lacrosse and Eagle Skatepark. All the addresses are verified. If you would like to contact me to add any content or anything else, akroll7@gmail.com. Also, started to add overhead views from google maps to the new parks being added. Eventually I will go back and add them to all and keep park information and events updated once I have the basics filled out for all the parks. Added Lake Delton and Fond Du Lac skatepark pages. Put up Steven Points Shred Fest on the Competitions page, more to come. If you have alrenate videos for any of the pages or anything else send me an e-mail. akroll7@gmail.com I don't look over the videos too much so if you have a better quality video to put up just let me know. 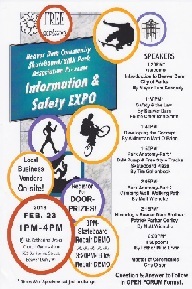 Event involving Beaver Dam skatepark tomorrow. Show your support and click on the flyer for info. I uploaded the Top Parks page with what I have heard to be some of the favorite skateparks around the state. Disagree or think another skatepark should be at the Top? Send me an e-mail at akroll7@gmail.com to let me know your submission or with any other information that you think should be added. Also if I messed up on any parks that aren't alive anymore, let me know! 2/17/2013 - Wisconsin Skateparks project has begun!